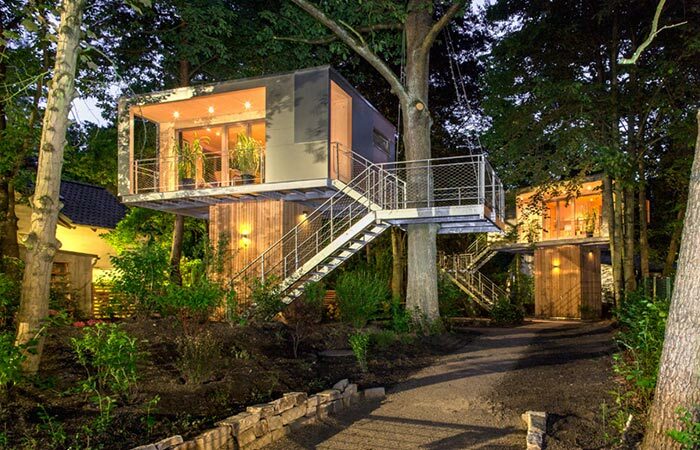 Who says grown people can’t live in tree houses? We are not talking about the ones some of us had when we were kids, but about genuine homes which are designed to incorporate trees in them and offer long-term living accommodations. This idea was put into motion by two German developers, Hans-Joachim Stegeman and his grandson Kolja, who reached out to a German design office called Baumraum in order to complete it. Much to our pleasure, the project was successfully finished and the results are absolutely astounding. 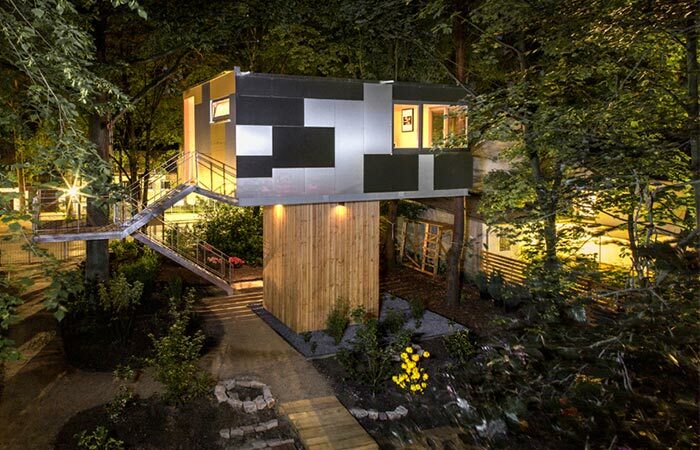 Two cubic treehouses were developed in a southwest district of Berlin called Zehlendorf, which is characterized by bourgeoisie buildings, a large number of gardens and a forest bordering it. Treehouses are mainly seen in rural or completely natural areas so it was quite an interesting move to build modern ones in a large residential area in Berlin. There are even a few perks to owning one of these as they require a very small area of the ground to be used which usually is not the case as every square meter ends up covered in concrete. 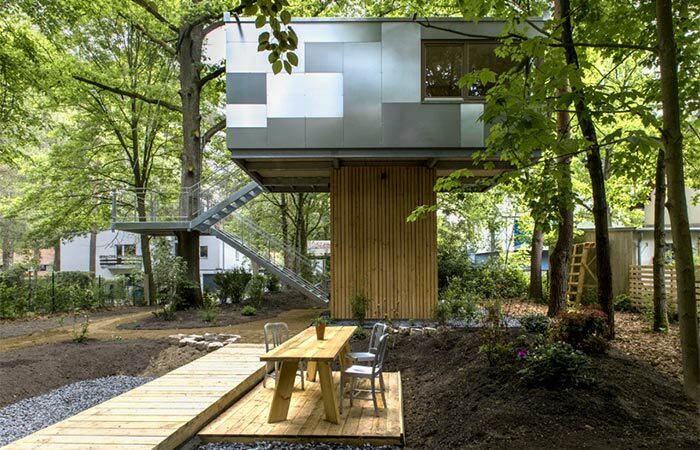 With a treehouse such as this, you can have a quite large and beautiful garden instead. Apart from that, a treehouse obviously requires a tree, so no trees get cut down due to construction. 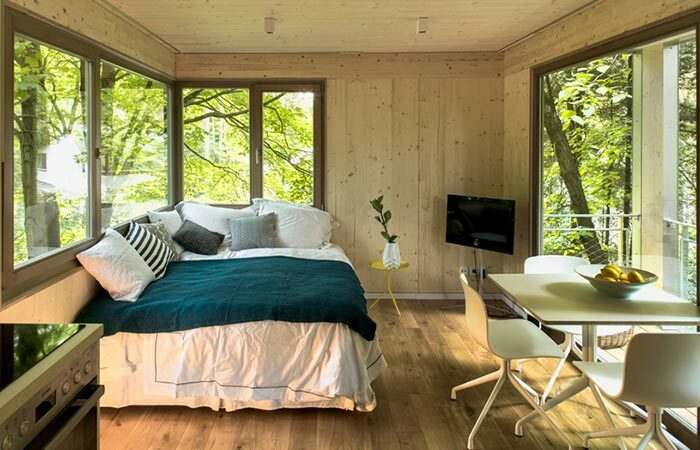 After the guys at Baumraum researched and studied about which approach to take with this project, they ended up building two cubic treehouses with 21 square meters of living space. Both of them are suspended 4 meters in the air with a small terrace at a height of 2.5 meters. The intermediate level of the treehouse and both flights of stairs are supported by suspensions from the oak, while the utilities of the house are located at its base. The materials used to build this awesome home are galvanized steel sections, aluminum composite panels and spruce panels. Spruce was largely used in order to make the treehouse appear more natural but, apart from that, spruce has high insulating properties, is quite breathable and easy to work with. The interior of this home has everything a person might need: a bathroom with a shower, a light-flooded interior featuring a kitchenette and comfortable bed, as well as beautiful home accessories.